This game is a lot like Smurfs Village. I've built up my park in a matter of hours. Could you make the wait for Skeeball a little shorter? Also we need more rides! I wish there was a lot more rides and items and I didn't need friends to build certain rides. Additional tickets cost too much money. Also crashes too often on my ipod. Please fix! I wish there were a way to earn tickets though, like you earn coins. It takes so long to build rides! How can I add friends or neighbours? How can I get more free tickets any cheats? change the time on your ipod. 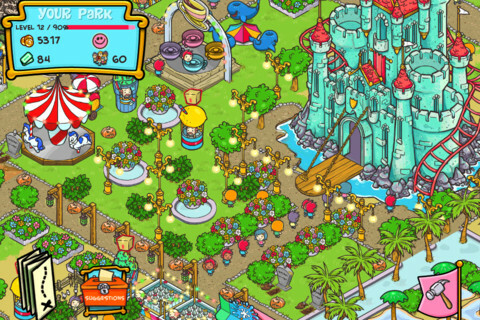 how can I change the theme park? anyone can help? My friend can easily built the rides which need friend's help on Ipad, but mine always failed on ITouch, is it becoz of the device? id: " REIREI (: "
I'm stuck at this task. Hey I'm trying to change theme too. Wanna get the rocket theme rides. I am trying to accrue for 50000 coins to get the fireball mountain. Mayb that will work as is the dinosaur theme. I'm gonna add some of u guys. Hope that can help us out! My id: futomaki79. Add me too if u want. Thx! Same here, Please help! I can't go through the task of put down three segments of paved pathway! Ivy, it's that light blue path u need to lay down. Hav u tried that yet? Ok I've added people as friends but how can I visit ur park? I cannot access ur parks for some reason. Pls add me tinseltan and gelp me build rides tanx..
How to add friends to my game?